Oh come on, they murdered such a great song, as expected. Completely lacks the soul and passion of the Bruno Mars original.<br><br>The awkward moment when the original is higher on the BOAT chart than the Glee cover. LOVE IT! i love the original way this was presented at the wedding! brilliant! Great Cover, awesome the way its done in the episode! Würde die Frau mit der schrillen Piepsstimme nicht mitsingen, wär's wesentlich besser, ah ja Lea Michele, das war ja klar. Sehr knappe 3, im Grunde schon nervig. Surprisingly quite good, again I think it's better than the Bruno original. Although some of the kids have poor voices, some sound good, which is better than lame Bruno throughout. This is his best song, but they've improved it. Weak and unsurprisingly redundant rendition. Severely watered down production. I quite liked it for a Bruno song. What is wrong with them? Why cover a song before it is even known to anyone?? Souless compared to the Bruno original but i did enjoy the male/female aspect to it. STEIGT HÖHER ALS DAS ORIGINAL EIN! Irgendwas stimmt wirklich nicht mehr..
Glee took a risk by covering a song that (at the time) wasn't widely known by the public. I'm certain the success of Glee's rendition is what convinced Bruno to make his version an official single. 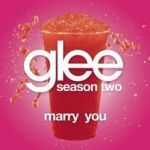 Back to Glee, I do prefer their version, cause I find the song works better in a duet style with male and female version. Not bad by any means but I just personally don't like it when people say this version is better than Bruno's. Unnötig zeitgleich zu covern, schlecht ist's freilich nicht. Not trash which itself should be celebrated but still poor. Well I find the original boring and it's my least favourite Bruno single so I was never going to enjoy this. This isn't anything horrible and I probably slightly prefer the original but it's not something I ever want to hear again.